I read via Darren at ProBlogger that Google Reader is revealing subscriber number count. So how do you find out how many Google Reader subscribers there are for your feed (or someone else’s)? Obviously this only shows the number of subscribers via Google Reader, and differs drastically from FeedBurner stats (well, it does for me, anyway). 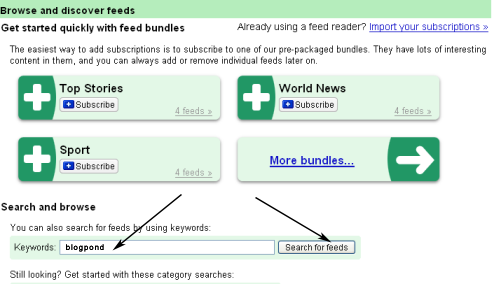 Do you notice a big discrepancy between your Google Reader figure and FeedBurner (if you use it)? By what coefficient (eg FeedBurner is showing X.X times more subscribers)? Is this figure a reliable metric to compare websites? Do you think I should add it into the formula for calculating the top 100 blog index? Mine shows 29, which is a big difference from the feedburner count. However about half of my feed subscribers seem to have got lost in the move – another reason for blogger users to use feedburner rather than the blogger feed. Lord – I don’t know how to make sense of mine. I tried earlier today when I read this over at Darren’s. I’ve got 7 in google and 7 showing as subscribed through google on feedburner. Oh forgot to add, my total subscriber number in feedburner is 3 times that showing in google. Karen – probably not made easy by the multiple feeds. I’ve just done an Idol update – I knew you’d be shocked. Kin – 😀 The difference is roughly the same here. Are most people quoting those type of figures – feedburner around 10x Google Readers subs? Some of the figures I’m seeing are around 2.5 – 4 x. While I’m displaying the FeedBurner numbers, they’re obviously not being included in the index (and of course it’s a pain in the proverbial to gather them)! Reader for me says 5, and FeedBurner has 16 for Sunday (5 of which are from Google FeedFetcher), which is down from a high of 42 a couple of weeks ago, and about half from before I switched by Blogger feed over to there. Interestingly, they report 2 subscribers to my blogspot feed, and 4 (including myself) subscribers to the old dot-net feed from Blogger. Sephy – hope everyone catches up. I notice FeedBurner shows more Google Reader subscribers than Google does, but this might include iGoogle. I’m still showing 18 subscribers from my old wordpress.com feed – which indicates some people are not really vigilant about deleting old feeds! Colin and Mig – thanks for the feedback. Sounds like there is wide variation among blogs. Some showing 2x all the way up to 10. Why is it a pain in the proverbial to gather Feedburner numbers? I’m rather technically inept. If Scott Yang hadn’t created a groovy script for me (which someone else changed into a batch file), I’d still be doing it all manually. This means that I have to query each feed directly (and manually), or go in and out of the pages at ratified, which probably takes the best part of half an hour.